In this image my “NEW Map of London ” i have tried to show all the important landmarks of London in a simplified ,easy -to -read manner . On the one hand , i wish it to be instructive – to help people understand where things are . On the other hand , I wish to create something aesthetically pleasing . Certainly it has been a logistical challenge . I hope to A. To Find a sponsor who will pay for exclusive use of the image for marketing purposes from January 1st 2019 to january 1st 2020 . and B. 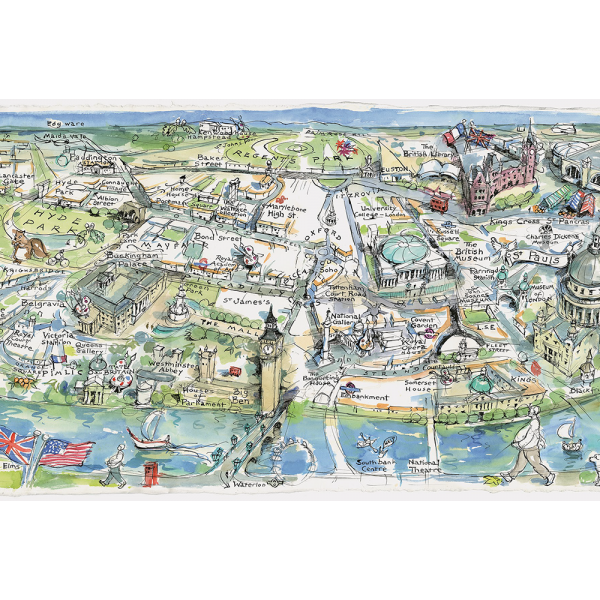 To sell the original of this map which is drawn and painted on 2 A1 size sheets laid lengthways . This map is available as a print in different sizes: A2 Special Edition (panorama measuring A3-A3 -840x297mms) for 100£ plus pp, A1 Special Edition (panorama measuring A2-A2 420×1188 mms) 150 £ plus pp and in the same size as the original drawing: A0 Special edition (A1-A1 594 x841mms) for 400£ plus pp. Please contact me by email to order the largest option.